If I had a choice, I would be a stay-at-home wife. Don’t get me wrong. I love my job. I also love the idea of working to earn a living. It’s just that the idea of homemaking and doing a plethora of things on the side at my own pace seems very appealing to me. (I say the lesser pressure from the outside world, the better!) And I can only do all that by quitting work. But the question is, am I ready for it? Am I ready to give up my job –my primary source of income– at this time? The answer is a big NO. Side story: Out of curiosity, I once asked my parents how they feel physically now that they are in their early 60’s (Mame) and late 50’s (Daddy), respectively. They both told me they feel the same as when they were in their 20’s except that their eye sight isn’t as sharp as before and that they must wear eyeglasses to be able to see clearly. Like, I couldn’t believe it at first! I asked them if they move slower now (they must be moving slower at their age!) and they answered with a big NO. Really? Yes, really, they confirmed. Okay, fine. I don’t know if it’s all in their mind but still, I want to give them the benefit of the doubt. If they feel that way today, there’s a chance that I could feel that way also when I reach their age…good for my early retirement goal! I’ve discussed this early retirement thing with the hubby before and he didn’t pose an objection, whatsoever. He plans to work until he’s 65 years old and that means we are going to be a one-income household only when I retire. That should be manageable for us, financially speaking. So yeah, age 50 it is! Now, this goal may change depending on what life will throw at me as the years go by. For now, I’ll stick with my early retirement goal and work hard on achieving my financial goals while on it. Teka, do we need to wait until age 65 to get the GSIS pension? Diba, may choice na 5-year lump-sum or outright pension? Ganon kay Mama eh. Hindi na ba applicable sa batch natin yon? Hay, I’m praying that the government could come up with the best retirement package when it’s our time. I’m crossing my fingers at this one. I did a little research (via the retireables around). Sabi nila, say you retire at age 50 and chose 5-yr lump sum, after 5 years start na ang pension (55 yrs old). 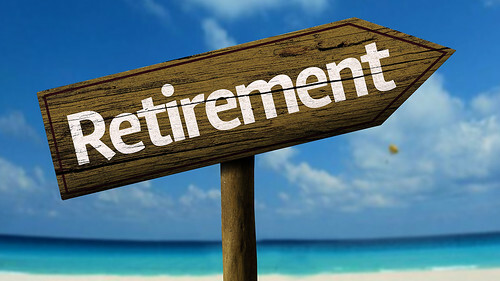 If you choose outright pension, the month following your retirement, pension ka na agad. Anyway, matagal pa na man yan, tsaka na natin busisiin pag malapit na. Ang importante yung increase next year. yey! I’ve been perusing of early retirement too! Just keep on the right track and both of us we’ll get there! Kami ay parang naka semi-retirement pero I would like to call it sabbatical 🙂 while we wait for an opportunity para makapagbusiness. Gustong gusto ko ding maging stay at home wife! Sa bahay lang ako habang nag aalaga ng mga bata tapos habang tulog sila mag gagantsilyo ako at mag aaral magbake. Sarap siguro nun! Pero malabo atang mangyari un. The only thing that I regret now is starting my retirement insurance so late. But hopefully matatapos ko pa naman sya before I plan to retire. Then invest na lang after if may sobrang income pa. Wow!! I wanna stay at home too but I can’t. Now I think I should consider early retirement. Kasooooo..baka nag aaral pa ang bata by that time. Constant dream ko rin ang early retirement. I always see myself teaching when I retire. Earning just enough for my transpo and incidental expenses from teaching, but having a full heart from being around young people.